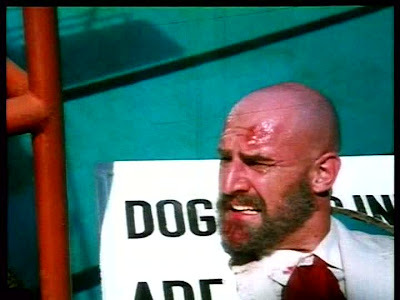 Q: Are you familiar with the ubiquitous firang henchman actor Bob Christo? but the avalanche of tweets upon the news of his death last month shows how joyfully and well-remembered he is. 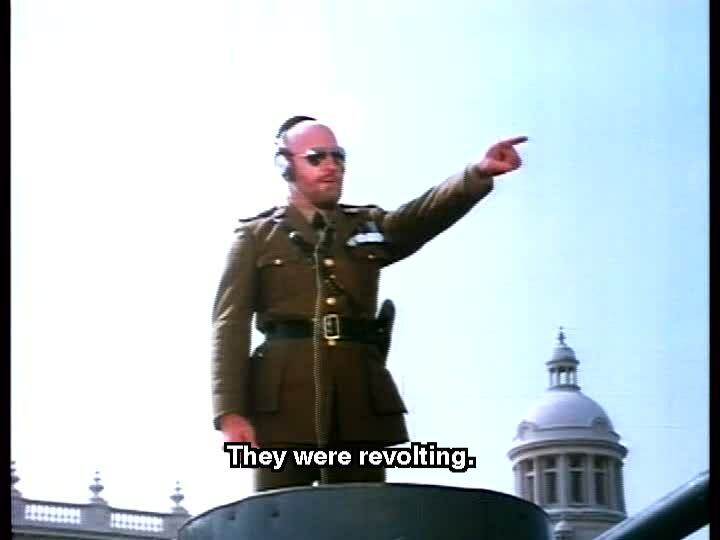 Partly, I'm sure, this is because he wasn't just "that guy" in the villain's crew: he was a big, red-headed white guy who would have stood out no matter what he did. But I think there must have been a little more to his impact than that. There are countless actors doing the same kind of role over and over—some even, like Bob, distinctive in some physical trait—whose names don't register with many of us attentive and excitable viewers. So what is it about Bob? What makes a successful and satisfying secondary henchman for two decades? Does he make particularly hilarious facial expressions when being thrown against a crate of smuggled gold? Is his appeal because he looks intimidating, so his defeat is proportionally great? Is it because he's foreign, so his conquest can feel patriotic? Is it because he's not only foreign but also white, so belittling him in ridiculous settings carries connotations of the overthrow of imperialism (never mind that's he's from a former British colony himself)? I wish I knew! But as I've been thinking about his roles and performances, something in Raja Sen's piece about him at his death set off a light bulb for me: doesn't it just take a special someone to land in a totally new country and subsist on letting himself get punched over and over again by the righteous? 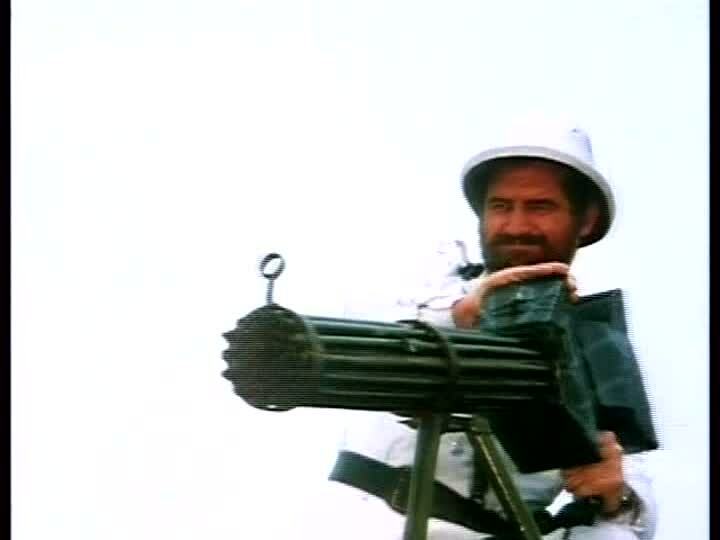 From a career that seems to have been made of few lines and fewer triumphs (by his characters), I decided to focus on a short (by filmi standards) appearance of Bob doing what Bob did best: getting his rear handed to him by heroes. 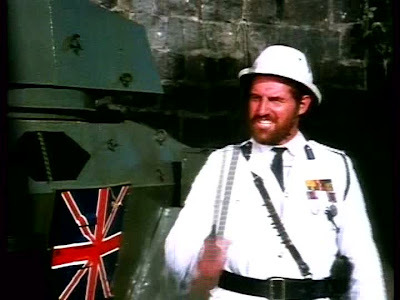 And there's no rear-handing in Bollywood that I enjoy more than Mard's rambling brawl between Amitabh Bachchan, assisted by trusty ani-pals, and the Britishers, represented primarily by Bob, in the whites-only social club. This scene has the beloved wackadoodle zeal typical of its director Manmohan Desai, but its political nature, as well as that of the entire film, adds something extra, gorging on every crumb of symbolism the setting has to offer and playing with the last idea in the previous paragraph. This film couldn't have existed without at least the concept of white foreigners, and I'd argue that the impact of the physicality of the scene is heightened by the looming presence of the big, bad gora. 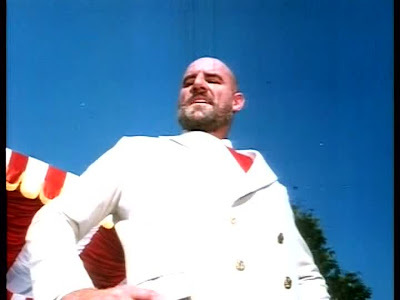 It's hard to imagine it without Bob Christo—I love Tom Alter, but imposing he is not, and a random backpacker or friend-of-a-friend couldn't have been a worthy adversary of the country's biggest star playing a character called "man." When the hero wins, it has to mean something, and maybe Bob Christo is the ultimate face of oppression in this setting, a persona that signified something important or enjoyable and was somehow familiar even in the resonant but exaggerated colonized la-la land that is the world of Mard. using a machine gun to mow down dozens of innocent villagers whose art the Brits have just plundered (interesting cultural heritage note there, now that I think about it), encouraged with the advice that "as much as this country sinks, you will rise,"
abusing and humiliating our hero (Amitabh Bachchan)'s adoptive father (Satyendra Kapoor) by forcing him to drink alcohol ("He's gonna be drunk for a whole year! "), at which point he is instantly drunk and clownish, then playing keep-away with the money he owes him. Since Simon's nemesis, Raju/Mard (who is of course Singh's son), is played by Amitabh, he's not just any son: he's one who, his father predicts when he is but an infant, "will shake the foundations of the British empire." This, of course, he does, but only after dealing Simon some humiliating blows while simultaneously blotting out one of the film's repeated signifiers of British racism. You won't be so proud for long! Coming to the aid of his not-by-choice drunk father, who is floundering in the club pool, Raju charges his tonga through plate glass doors and into the pool. As he cradles his father, Simon points a gun at him. He cracks his whip, yanking the gun from Simon's hands. Moti enters, barking gleefully. "Now look!" proclaims Raju. 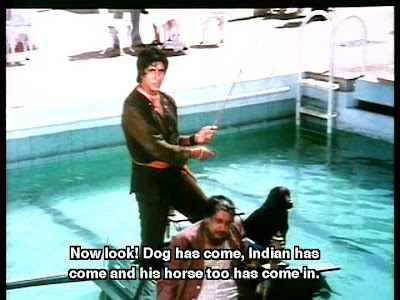 "Dog has come, Indian has come, and his horse has entered too!" The the gathered English club-goers back away from the edge of the pool as Raju dries himself off. Raju grabs liquor from a waiter, shouting "One who doesn't drink, you force to drink," swigs from the bottle, and shoves Simon aside. "I'll show you how potent Indian liquor is." He uses the whip to pull some from his tonga, bites the cork off the bottle, and spits it at Simon. Offering the bottle, he says "If you drink it once, its influence will last until you die." Simon recoils: "I don't drink Indian liquor." "Why?" says Raju. "You can drink Indian blood. 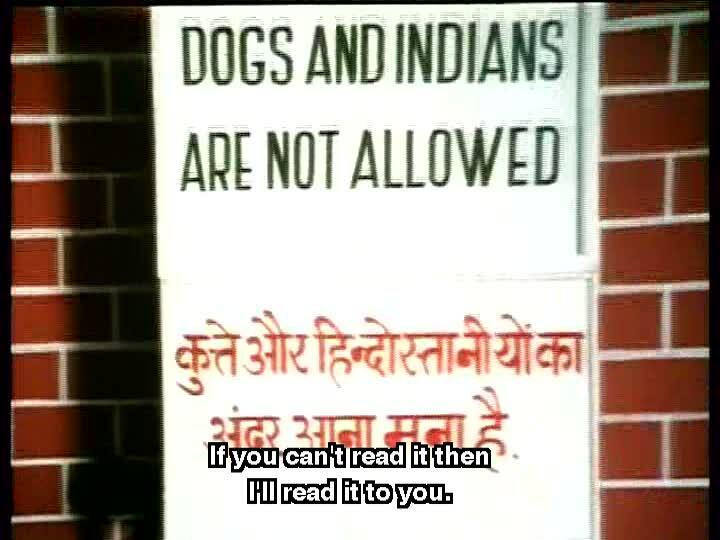 Can't you drink Indian liquor? "Raju knocks Simon onto his back, kneels on his chest, and forces the booze down his throat. As everyone looks on in silence, he commands the band to keep playing. Meanwhile, Moti leaps on Simon's cohort General Dyer (oh yes) (Kamal Kapoor), who finally yields all the money owed Raju's dad. Raju sticks a 4-anna stamp on his head and kicks him into the pool. Simon staggers up, Raju's whip in his hand, but of course things won't turn so easily. Raju sends Simon flying through a balcony railing, Simon retaliates by kicking Raju in the face, and Raju then smacks him with another of the club's frilly accessories, a lattice bench. And then, in the moment that cinches this sequence as my favorite fight scene in Hindi cinema, Raju sends Simon flying head-first into the back of the band's bass drum, his face sticking out of the skin on the front. 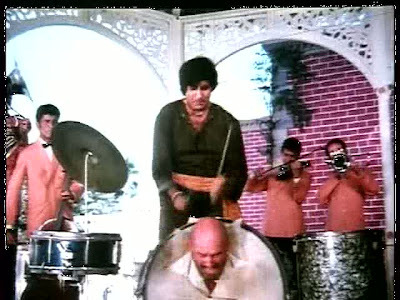 Raju grabs the drumsticks and pounds on Simon's bald head as the band—all Indians—plays on and Moti dances. Raju kicks the drum and it rolls towards the edge of the stage. As Simon stands up and tries to get free of the drum, Raju punches him and then grabs him by the collar and slams his head agains the drum kit's cymbal a few times. Simon finally grabs the cymbal stem and whirls around, smacking Raju in the face with it and sending him flying off the stage into a gathered crowd of onlookers. 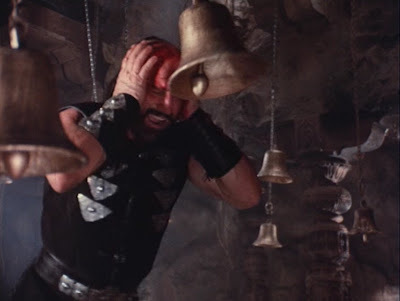 Simon hurls the cymbal frisbee-style at Raju, who ducks, letting the cymbal decapitate a hideous faux classical statue. Raju shakes up a champagne bottle and sprays it at Simon, who grabs one of the many DOGS AND INDIANS ARE NOT ALLOWED signs out of the ground and uses it as a bat to deflect the empty bottle Raju hurls at him. Raju upends a table and throws it at Simon, knocking him onto his arse. In the most, and, it must be said, almost tiringly, symbolic moment of the scene, Raju kicks Simon and flips him over, pounding his face into the sign. Simon's head bloodies the sign, obscuring the NOT. then on Raju's command comes down the stairs and pees on Simon's face, and Raju upends Simon into the pool. Raju's dad, appearing out of who knows where, tells Raju that that's enough and it's time to go. Simon splashes around yelling "You dirty swine! I won't spare you! I'm still the boss around here! You just wait! Idiot!" On his way out, Raju signals the bland to play, and they strike up with "Tequila." See it here starting at about 8:00. That, in short, is why I love Bob Christo: a stranger in a strange land, he repeatedly, and it would appear with great glee, bleeds for the revenge of the colonized while their dogs pee in his face. What a man. 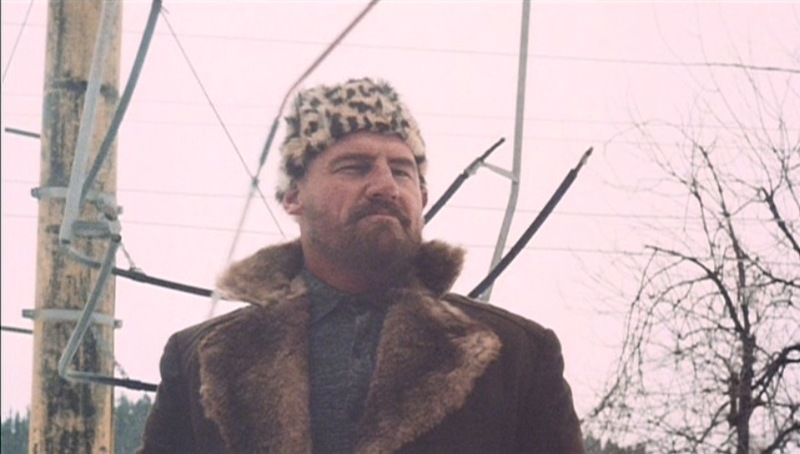 As I noted on the post at CinemaChaat, I like to think that when he was filming these things that Bob was inwardly grinning with glee and thinking "I'd never get to do anything this crazy in Hollywood!"